While I was nearing the end of my bachelor's degree in chemistry, I took a graphic design class to unwind a bit. It had been a long standing interest for me, from making BMX ‘zines in high school to screen printing t-shirts, making flyers and stickers, and doing various small-scale projects in the years that followed. Taking an actual class in the subject seemed like a good way to go back and cover some ground I may have missed along the way when I was getting my hands dirty. One of the more interesting aspects of the subject that I came across in the class is the idea that there are principles that can be applied to a work of visual design and, for whatever reason—social conditioning or neurobiology or something else—it prompts an effect on the viewer. One of these principles that is commonly employed is the use of certain geometries in the composition and layout. This essay, however, is about another of those ideas: gestalt theory. If you've found what's on this page to be useful, send me an email. I'd be happy to hear your thoughts on it. If you plan on referencing this piece in an academic paper, here's some help with the citation. For other uses, please see the copyright information on this site. Young, Shawn. “Gestalt Theory in Graphic Design.” Shawnyoung.com. 18 December 2002. Web. . <http://www.shawnyoung.com/writing/gestalt-theory-in-graphic-design.php>. 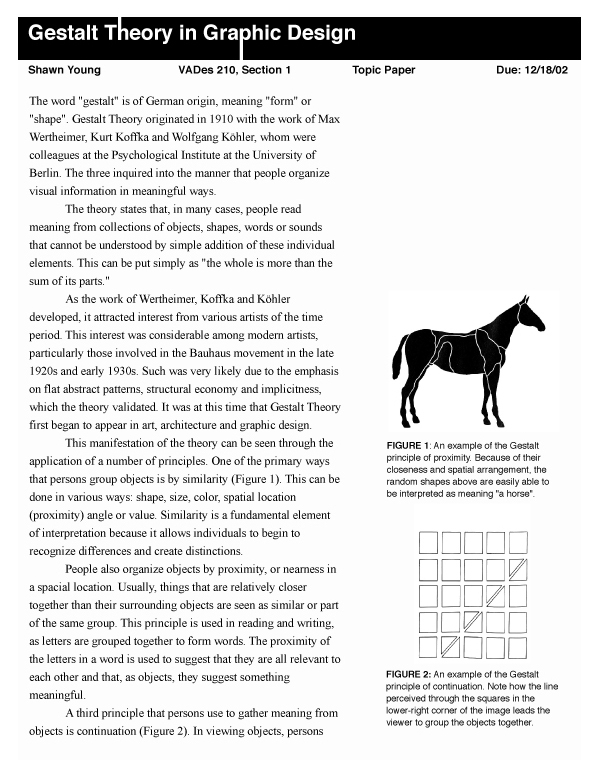 Young, S. (2002, December 18) Gestalt Theory in Graphic Design. Shawnyoung.com. 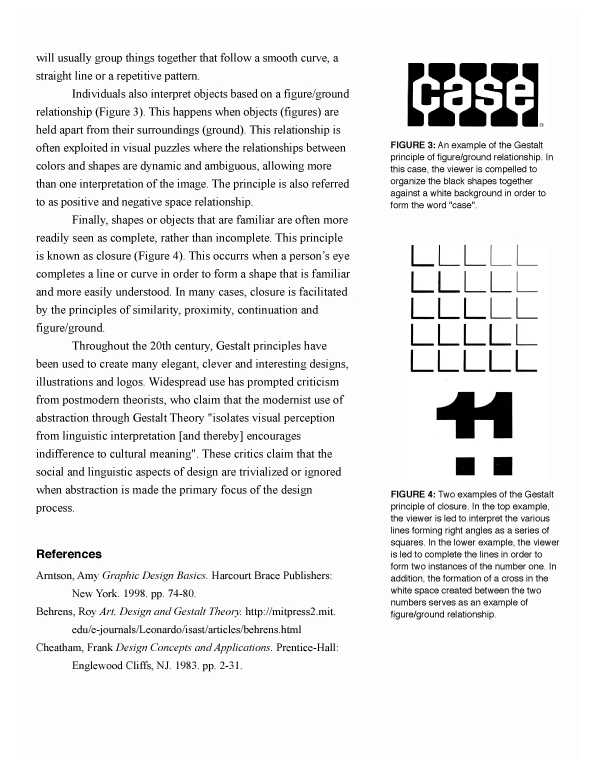 Retrieved from http://www.shawnyoung.com/writing/gestalt-theory-in-graphic-design.php. Young, Shawn. 2002. "Gestalt Theory in Graphic Design." Accessed . http://www.shawnyoung.com/writing/gestalt-theory-in-graphic-design.php.